Purchase the aLearning book with one click! COPYRIGHT 2015 ELLEN BEHRENS. ALL RIGHTS RESERVED. aLearning is proud of its affiliation with Tagoras, provider consulting services and of unbiased research on association learning trends and products. To see the full catalog of Tagoras reports, click here. Don’t be. Here’s the easy-sneezy version of what you need to know to help your association or nonprofit. First, “The Cloud” is just another way of referring to the Web, the Internet, cyberspace. Services “in the cloud” are available via the Web instead of systems having to be installed on your server(s) or applications or programs being installed on your desktop. It means they’re out there — in cyberspace — and you connect to them. What this means is that the responsibility for maintaining those systems rests on the company providing them, instead of on you. Yes, this is very good news. “SaaS” or “Software as a Service” has been around for awhile, and “The Cloud” references have sort of evolved from that. "…[T]here will be constant price pressure as new suppliers enter the marketplace and/or new cloud offerings are promoted." TSIA anticipates a shift from long-term licensing fees to micro-transactions, which could be pricing per user per month, per feature, per gigabyte of data stored, per content downloaded, or any number of other similar yet singular types of transactions. We’re already seeing this from some vendors. Charging a $X fee per user per month for up to X number of users is one example. This is great because we’ll only be charged for the actual number of users in the system and/or for the actual downloads or other access options. You can get your calculator out and do the math if you want, but the logic is clear: the better the deal is for us (the consumers), the more the vendors will have to work to make the same levels of income. Here’s an example. Let’s say you’ve decided on ACME LMS. Let’s say you’re just starting with elearning so you’ve chosen their low-end “Basic” option: features A, B, and C, for $5/mo per user. Let’s also say they have a “Standard” option that includes the features you already have and use, PLUS features D, E, F, G, and H for $10/mo per user. Even with the same number of users, ACME LMS stands to make more money from you. They might not try to get you to opt for the “Standard” bundle at first, but you can bet they’ll be looking to “upsell” you at some point. They have revenue needs, and you’re the way to fill those needs. I’m not saying don’t take the upsell. But I will tell you to ask for the data. A hidden benefit of a product that sits in the Cloud is that it’s generating a bunch of data on your use of the system. You might be getting that data, you might not. But you can bet the company is sucking as many numbers out of the system as it can get. That’s not a bad thing. They can tell you how your members are using the system in ways you probably can’t imagine. It’s to their benefit to do that. So if they’re suggesting an upgrade to another bundle — let’s say to the Standard option in the example we’ve been using — then ask to see the data. Look at how the features you’d be adding could enhance the learners’ experience in the training you’re giving them. How many users would likely be affected if you incorporated those additional features? Would it be worth the additional cost? Why? Why not? If you’re not convinced, no need to make the jump. The next “level” of service will be around for awhile. You can make the change whenever your organization is ready, and you can do it pretty quickly compared to the old license-renewal cycles that are measured in years. Yes, there are terrific benefits when you let your elearning programs live in the Cloud rather than on some server in a back room someplace. Start modestly, graduate up if needed, and be sure the vendor you choose has a great reputation for uptime and excellent back-up systems. Could your elearning benefit from living in the Cloud? Of course, your first step in any comparison of LMS/LCMS products is to get a copy of Tagoras’ 2011 Association Learning Management Systems Report (see “Tagoras on Target” post for more info, or go directly to http://www.tagoras.com/catalog/association-lms), but if you want some comparison information for other systems, here are a couple more resources to check out. PAY ATTENTION TO THIS FINE PRINT: Unlike the Tagoras report, these are corporate-focused, so the systems aren’t generally aligned with what we need. Why check them out? Maybe they have something unique that you need. Or maybe you just want to be able to convince the powers that be that you’ve done your due diligence, and other systems out there just don’t fit your needs or price. I’ve already mentioned Craig Weiss’s fabulous work on his online database of LMSes (haven’t seen it yet? Go here… and don’t forget to subscribe to his very helpful blog). And if you haven’t discovered the valuable resources provided by Brandon Hall Research, you need to check out their KnowledgeBase: “an online, database-driven repository of information about learning management systems.” You can register for a three-month access ($995) or a one-year access ($1595). It covers 130 systems. That could be overwhelming to analyze each yourself — not to mention compare and contrast the various options. Think it’s pricey? Well, think of it as an investment. Think of it as part of your risk mitigation plan. You know what we say about computers: garbage in, garbage out. You input bad data, and you’re going to get lousy results. The same is true in your hunt for the best LMS. Without the best information in hand, you won’t make the best decision. Check out the details or subscribe to the database here. Want an overview of the KnowledgeBase? Register for BH’s FREE Webinar scheduled for Thursday, May 19, 1-2 p.m. EST. Details on this event and registration can be found here. Jeff Cobb and Celisa Steele at Tagoras, Inc., have updated their Association Learning Management Systems Report — and although it couldn’t have been easy (all that data! ), we are the beneficiaries of their dedication and effort. With profiles of 15 companies that provide learning management systems (LMSes) to the association vector, this report covers everything from company background to product specifics (features, cost, implementation timeframe, and much more). It is THE place you need to start if you’re thinking about incorporating an LMS into your learning environment. And, according to their data (from a separate report, “Association Learning + Technology: State of the Sector”), nearly 78% of responding associations said they use elearning; of these, just over 67% are already using an LMS or are planning to incorporate one within the year. Few topics cause as much confusion and concern as getting an LMS/LCMS. Despite the broad range of topics the aLearning Blog covers, the LMS posts are by far the most re-read and searched of all. It’s easy to see why: implementing an LMS can be one of the more expensive investments an association makes, and its visibility is pretty high. Unlike a association management system (AMS) or an accounting system which operate behind the closed curtain of the association’s central office, an LMS works upfront with your members — they see it and use it. If there are problems with your AMS, your members might never know about it. But when they need to access the LMS to complete a time-sensitive piece of training to get their certification renewed in order to get that much-wanted promotion or raise, and that system crashes on them — well, you get the picture. Start with what you must have in a system: not just the features and cost, but consider whether you have the personnel to manage it internally or have the vendor host it, for example. Once you have a good idea of what you’re looking for, invest in a copy of this report. At over 560 pages, it’s a hefty resource, but you won’t have to wade through it page-by-page. The report includes various comparison tables so you can see which products match your needs and focus on those profiles to get more detail. 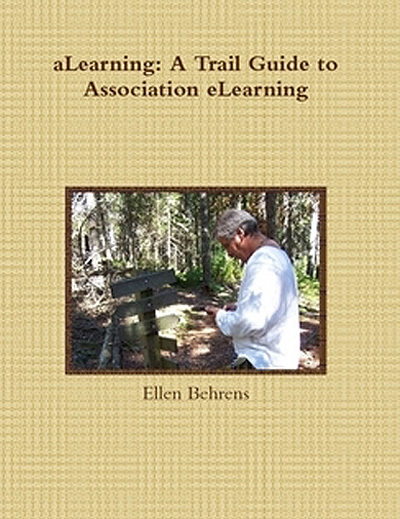 If you’ve read aLearning: A Trail Guide to Association eLearning, then you know I’m an advocate of data. Of being able to drop heavy chunks of information on someone’s desk to support an expensive decision. This report can do that, too. Worried about the cost of the report? Okay, I challenge you to find and investigate companies that might have the LMS you need, then compare them (based on the information YOU gathered) in order to narrow your list of places you’ll send an RFP. Oh, and don’t forget to calculate the risk of ignoring the other stuff that will have to be pushed aside so you can devote your valuable time to doing what’s already here, in this report, ready for you. No question that the cost of the report is worth every penny (and a lot more!). Don’t waste another second (time is money, even in the non-profit world!!). Find out more about the report and how to get your copy here. If you haven’t seen Craig Weiss’s post “LMS Vendors: R u hearing us?” then you’re missing a valuable post on what you could be doing — albeit unwittingly — to turn off potential customers. And for the association learning leaders out there who have been struggling to narrow your LMS vendor options, you’ll find in Craig’s post some telltale signs to look for and some guidelines. Can’t recommend this post highly enough.